NEW ORLEANS – The first big weekend across all three divisions in NCAA Cross Country and both divisions in NJCAA Cross Country passed and with it, several incredible performances took place. Those athletes who stood out the most were named National Athletes of the Week by the U.S. Track & Field and Cross Country Coaches Association (USTFCCCA) on Monday. Find out more about each of these runners by clicking their names or scrolling below. 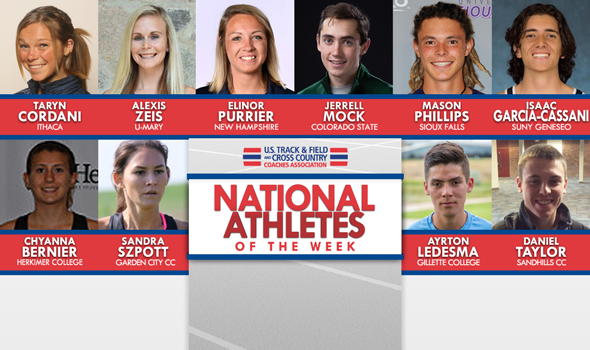 National Athlete of the Week is an award selected and presented by the USTFCCCA Communications Staff at the beginning of each week to 10 collegiate cross country athletes (male and female for each of the three NCAA divisions and two NJCAA divisions). Only three men in NCAA Division I history have won back-to-back individual titles at the Roy Griak Invitational: Providence’s Ben Noad (1997-98), BYU’s Kip Kangogo (2002-03) and now Colorado State’s Jerrell Mock. This past weekend in Falcon Heights, Minnesota, Mock cruised to an 11-second win over UCLA’s Garrett Reynolds. Mock pulled away after 5K and also helped the Rams capture the team crown with a score of 47 points. Last year Mock parlayed his win at the Roy Griak Invitational into a 54th-place finish at the NCAA Championships. Chances are strong he’ll improve on that in 2017. There is something about Franklin Park that sits well with Elinor Purrier. Purrier turned the muddy 5K tract into her personal playground for the second year in a row as she won the individual title at the Coast-to-Coast Battle in Beantown. She crossed the finish line in 16:48.6, 14 seconds ahead of Indiana’s Katherine Receveur and well ahead of her time from 2016 (17:05.2). Purrier also beat every runner from No. 7 Providence in the field, including 2015 XC All-American Catarina Rocha. The next time Purrier goes up against top talent will be October 14 at the Pre-National Invitational. Purrier finished fifth at Pre-Nationals last year. Mason Phillips smoked an incredibly large field of athletes at this past weekend’s Roy Griak Invitational, winning the Maroon Division race with a time of 25:30.5. The native of Bailey, Colorado finished just under 30 seconds faster than his nearest competitor in a race that featured over 450 athletes. Averaging 5:08 per mile, Phillips was 10th at the 5K mark, but really turned on the heat to wrap up the race to help his team finish fifth in a very crowded field. Alexis Zeis turned on the afterburners at the beginning of the Roy Griak Invitational Maroon Division race and never looked back. The senior from Bismarck, North Dakota won going away after leading for a majority of the meet. Trailing only one runner at the 1K mark, Zeis moved in the lead shortly thereafter, maintaining a mile pace of 5:50 in a field of 400-plus runners, winning with a time of 21:41.3. The individual title was the third in a row for the senior at the Roy Griak Invitational, becoming one of just two women in NCAA DII history to accomplish that feat (Minnesota-Duluth’s Morgan Place did so from 2008 to 2010). SUNY Geneseo was locked in a tough team battle with RPI at the Purple Valley Classic this past weekend and needed somebody to step up. That’s exactly what the Isaac Garcia-Cassani did. Garcia-Cassani pulled away from RPI’s Grant O’Connor and Sean O’Connor to win the individual title and give the Knights the all-important low stick. Thanks to Garcia-Cassani’s victory, SUNY Geneseo captured the team title by eight points. This was Garcia-Cassani’s second individual victory in a row at the Purple Valley Classic. Garcia-Cassani won six individual XC titles in 2016 and finished fourth at the NCAA Championships. Taryn Cordani won three NCAA titles on the track in 2017. If all goes according to plan, Cordani will add a fourth in the calendar year – but this one on the grass. Cordani surged to the individual title this past weekend at the Purple Valley Classic and made a statement doing so. The senior crossed the finish line 27 seconds ahead of Coast Guard’s Kaitlyn Mooney and well ahead of several NCAA DIII individual title contenders. There were athletes from nine teams ranked in the most recent NCAA DIII National Coaches’ Poll entered in this race. Competing against some of the top talent in NCAA Division II, Ayrton Ledesma of Gillette College put together a performance for the ages, finishing third at the Roy Griak Invitational Maroon Division, behind just Mason Phillips (see above) and another athlete from Sioux Falls. The product out of Tillamook, Oregon, was just a shade over two seconds behind the runner-up, but saved his energy for the last 3K after coming in at 11th at the 5K point. Sandra Szpott was up against a pack that consisted of NCAA Division II athletes, but that didn’t stop her from blazing past the competition at the Emporia State Papa John’s XC Invite. The sophomore from Warsaw, Poland won by over 30 seconds with a time of 18:27.9 in a race that featured close to 150 women. In just the second race in the history of Sandhills CC, freshman Daniel Taylor put his school on the map by winning the Monarch Cross Country Classic against a field of NCAA Division II and Division III schools. The native of Whispering Pines, North Carolina, won the 8K with a time of 29:21.3, finishing nine seconds faster than the runner-up. Not only did Taylor win the individual title, but his outing helped the Flyers finish second as a team. At the SUNY Poly Wildcat Classic Invitational, Chyanna Bernier was pitted against a slew of competition from the NCAA Division III level, but that didn’t stop her from putting together a solid outing. The sophomore from Ilion, New York, finished third in a field of almost 100 with a time of 23:17.8. Bernier was only 17 seconds off the lead, and wrapped up the meet as the top finisher from the NJCAA level.